I dream about tornadoes a lot. I suppose that stands to reason since I live in a cornfield located in the eastern portion of tornado alley and have been ducking and covering all of my life. Okay, that’s not entirely true. I fully admit that I’ve only ever taken cover during a tornado warning at school and at Walmart, the only job I’ve had that made me. The only other time I was at work during a warning was when I worked at Taco Bell and then we were slammed and I couldn’t take cover if I wanted to. A lot of people wanted their last meal to be a gordita, I suppose. I haven’t taken cover in my own house since I was a kid (and I was the only one that did). My parents, hell everyone on my block, would go to the window or go outside whenever the sirens sounded. We still do. Twenty-five years ago, when the warning system wasn’t the greatest, false alarms were the norm and a seeing-is-believing attitude was adopted. It’s become so normal to me that if the warning siren goes off and I’m told to take cover, I get anxious because I can’t SEE what’s going on. I’ve been on the computer playing Word Whomp while a tornado touched down a mile from my house. I’ve grilled during tornado warnings. I drove through one on the way to a bar (in my defense, I didn’t know there was a tornado; I just thought it was a really bad storm and didn’t learn differently until I got to the bar). The only precaution I take it putting on my shoes because I’m convinced a tornado won’t hit my house unless I have to climb out of the rubble barefoot. Despite all of this, I’ve never actually seen a tornado (like I said, I drove through one without actually seeing it). But I dream about seeing them all the time. In the dreams, I’m almost never concerned about being hurt. In most of them, if I haven’t taken cover, I usually have an easy time of doing it. And then as I’m watching the twister do its thing, I tell myself that this time it’s not a dream. This time it’s real. I’m really seeing this tornado. Inevitably, I wake up and spoil it for myself. 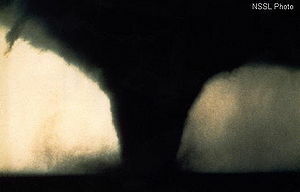 According to dreammoods.com, dreaming about tornadoes could symbolize extreme emotional outbursts and temper tantrums. It could symbolize volatile situations or relationships. It could symbolize feeling overwhelmed and out of control. I suppose it could, for a normal person. But, the wonder and awe I feel during these dreams kind of cancels those interpretations out, huh? To me, tornadoes are beautiful, amazing things, yet I don’t discount their ability to destroy anything that gets in their path. However, I feel like (particularly in my dreams) that they won’t hurt me. It’s like swimming with sharks. They’re beautiful, but potentially lethal creatures and you have to have some confidence that you’ll emerge from the water unscathed if you’re going to get into the water in the first place. Did I mention that I dream about sharks a lot, too?